Is it a toilet plunger, a vase, a Beanie cap, or a Safari Hat? It's Hat-A-Rama ! It's an updated comical blend of Trouble-Wit and Chapeaugraphy that is destined to become an instant kid show classic. It's a must if you work for children. This effect normally sells for $40 from magic dealers. Devin shows you how to make it up for a fraction of that, and easily make replacements when the effect wears out. Bring a child up to help and say, "We need a special hat and a magic wand". From then on it's NON-STOP laughter. Magician brings out what appears to be a toilet plunger and places it on the kid's head. Pulling off the handle causes the plunger to change into a flower vase and the magician is left holding a MAGIC WAND. Claiming the vase is the hat; it is placed on the child's head and visibly becomes a comical BEANIE STYLE CAP. Oops, the magic isn't working. Must be because the hat is upside down. Magician flips the hat and suddenly it changes into a comical SAFARI HAT. Now the magic works. This has been a proven winner in Devin's kid shows for the last 10 years and is finally being released to magic world after many requests. This is a routine your audiences will not have seen before. Most importantly, this is not an effect everyone else is doing. 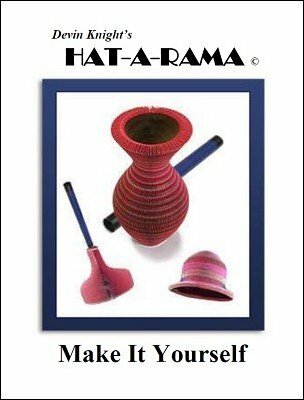 Stand out by being different with Hat-a-Rama . Four magical changes. Complete directions with photos and script. Plus the secret sources to find the props you need. Also includes a routine that can be done for adult shows. 1st edition 2014, 7 pages. Although honeycomb hats are temporarily not available from the source given in the PDF. They are still available worldwide. You need only go to Google and search for China Honeycomb Vase Hat and you will find hundreds of companies selling the hats. In some cases, you can buy just one hat and get free shipping to the USA. This is a great alternative until someone buys the company and once again makes the hats available in the USA. A great little book on the topic of the use of transforming hats to add a little something special to any show. Sad to report, the resource suggested in the book for obtaining these hats is retiring and selling the business. They are currently entertaining a few offers for the business but not producing product in the interim. There are other sources for the product if you internet "dig" just a bit. I am on the mailing list for updates on when the product will once again be available. When I receive the word I will e-mail lybrary.com the newest resource. DO NOT let this stop you from purchasing now. The techniques and patter are worth every penny even without the suggested prop.